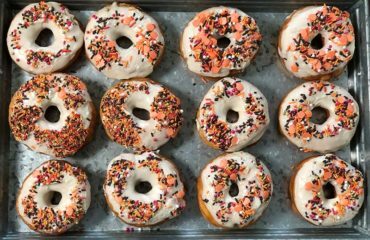 These pumpkin frosted donuts, topped with Halloween sprinkles (or jimmies, as we say here in New England), simply scream October! 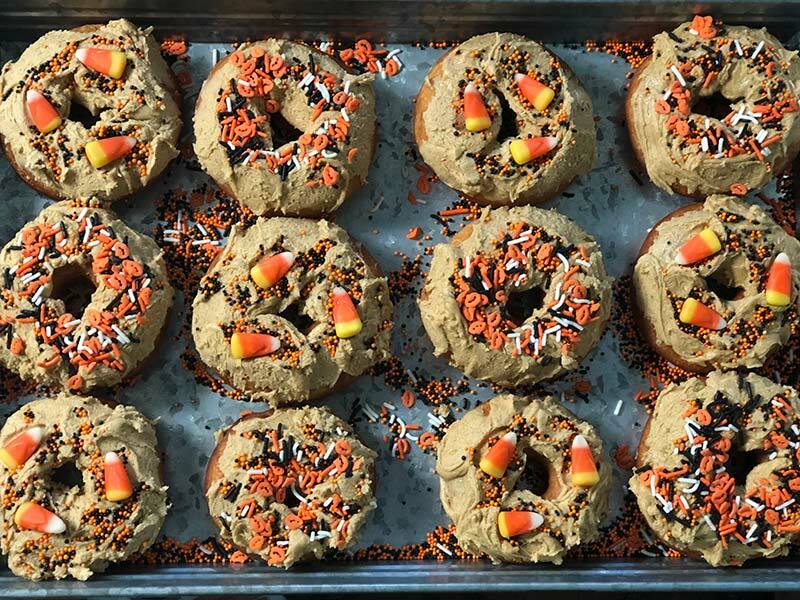 Be warned: these donuts are very sweet. 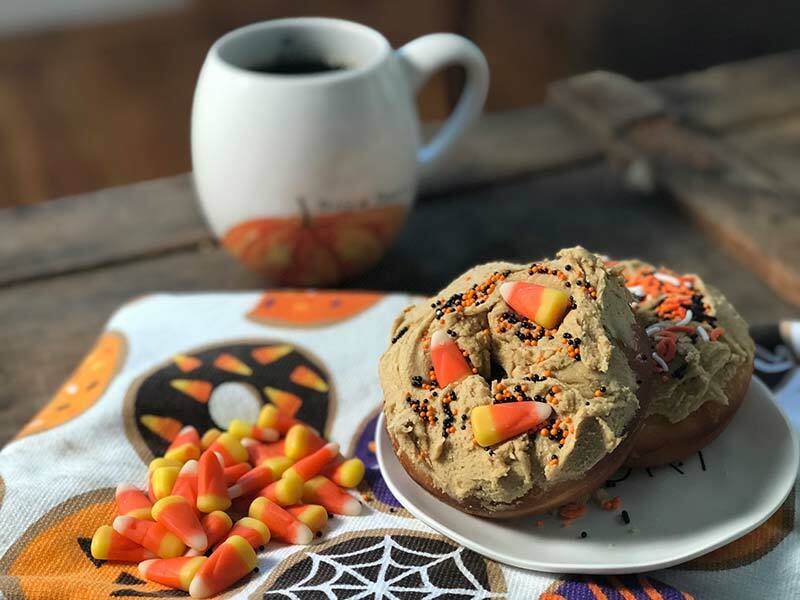 You will be put into a sugar coma of trick-or-treat night proportions if you indulge in more than one at a time. That being said, they are so pumpkiny and delicious. 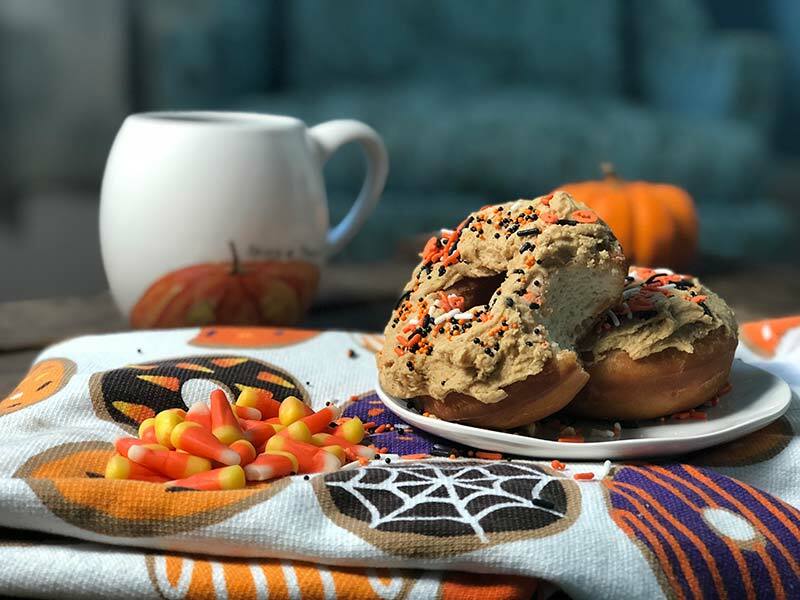 Make them for breakfast or for your next Halloween party. 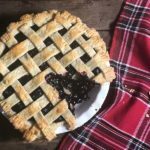 The shorter, printable version of this recipe can be found below, but read on if you want a more detailed step-by-step. In the bowl of your KitchenAid mixer, empty the contents of 1 packet of instant dry yeast, such as Fleischmann’s RapidRise. Be careful not to use another kind of yeast, such as bread machine yeast, by mistake. Pour ½ cup of warm water on top of the yeast and let sit for 5-10 minutes. 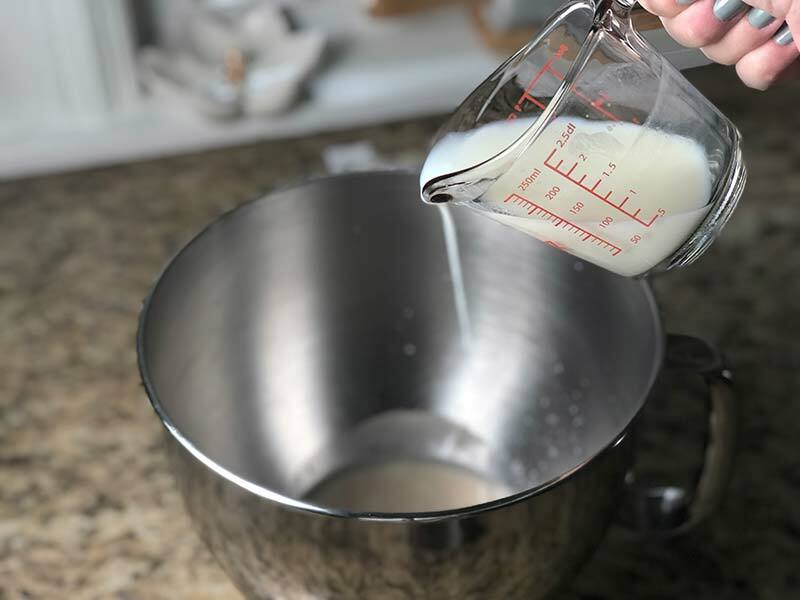 Add the buttermilk, melted butter (30 seconds in the microwave will do the trick), granulated sugar, baking powder, salt, and just 1 ½ cups of flour into the yeast/water mixture, and beat on medium speed with the paddle attachment, working up to high speed, until incorporated. 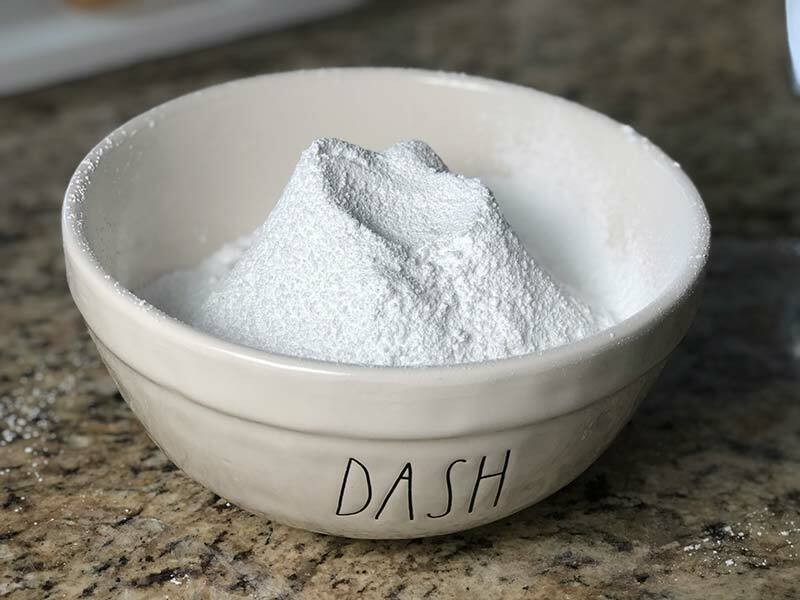 Then, add in the remainder of the flour in ½ cup increments—letting each fully blend into the mixture before adding the next. Beat on high each time. 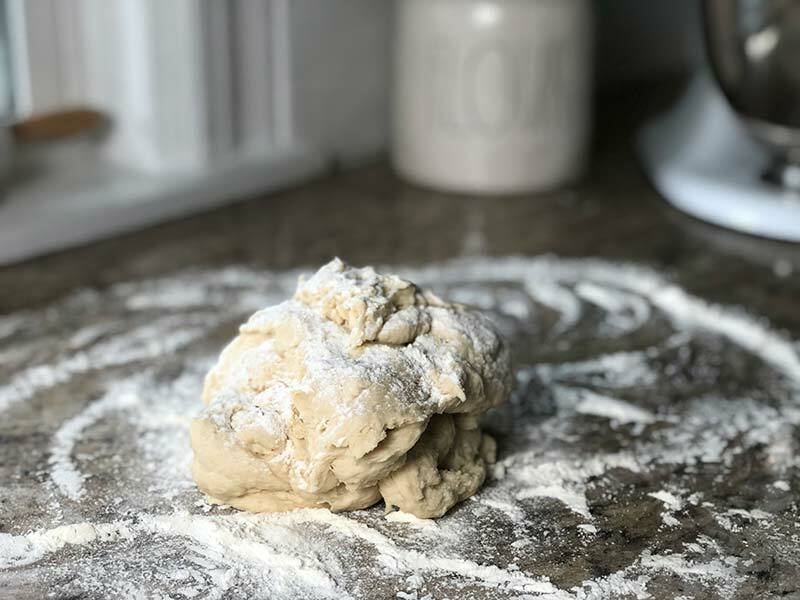 Once all of the flour has been incorporated, place the dough on a floured countertop. Sprinkle some more flour on top of the dough and begin to knead. 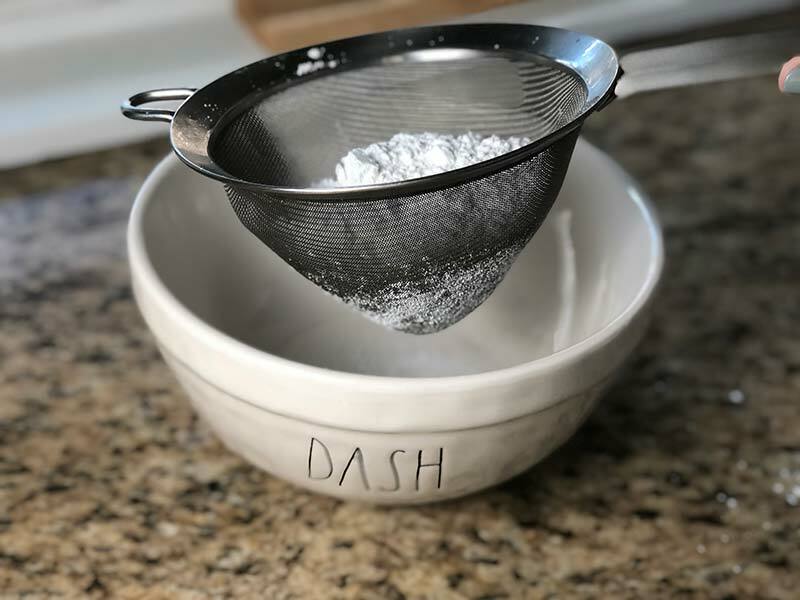 Keep dusting with flour until the dough is no longer sticky. Then, use a rolling pin to roll out the dough until it’s about ½ inch thick. As you roll the dough out, continue to turn it and roll in new directions, as well as flip the dough over to ensure you roll on both sides. Continue to flour the countertop so that the dough does not stick to it as you do so. 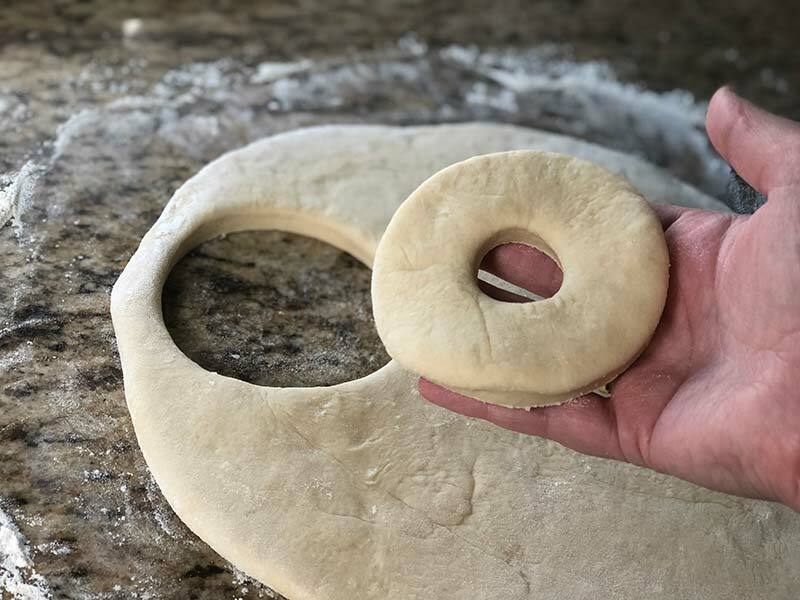 Once the dough is rolled out to about ½ inch thick, dip your donut cutter into some of the leftover flour and begin cutting the dough. This process is very similar to making sugar cookies. 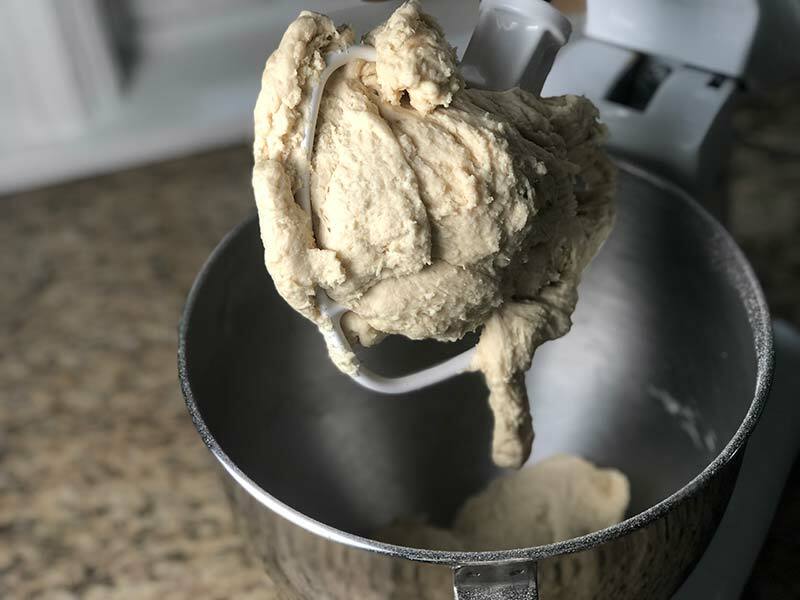 Continue to cut the dough until there is no space left, then roll the scraps and donut holes back up, knead the dough, roll it out again, and repeat. You should have enough dough to cut 12 donuts. Flour a couple of plates and place the donuts on them. Cover each with a cloth napkin or towel, and let the donuts rise for one hour. When you have about 20 minutes left to wait, you can begin making the frosting. 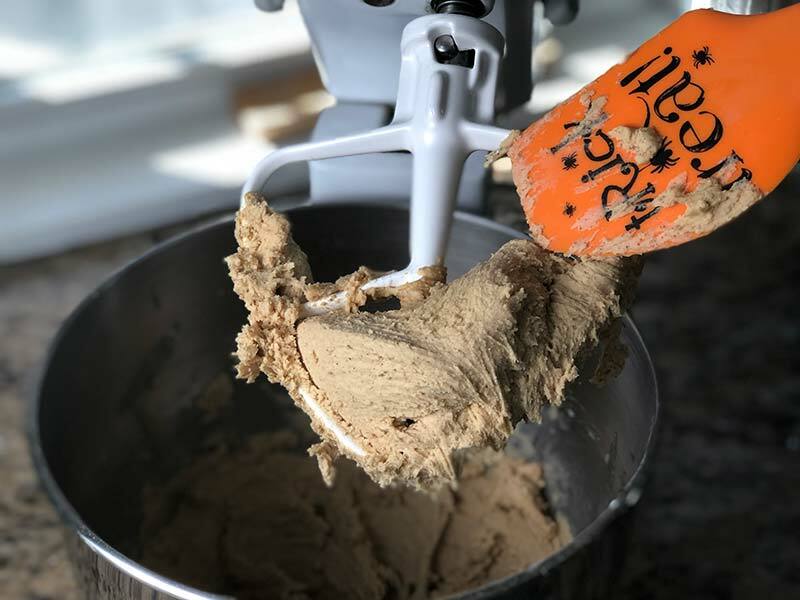 This pumpkin frosting recipe was something I came up with accidentally while testing out the idea of molasses frosting. I decided to see what molasses frosting would taste like with a little pumpkin spice and extract thrown in—the outcome was delicious. 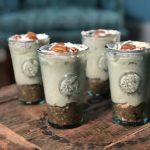 Just like that, this recipe was born! First, cream the cold butter in your KitchenAid mixer with the paddle attachment on high speed. Let it beat for about a minute, until the butter is fluffy. Next, sift three cups of powdered sugar into a medium-sized mixing bowl. I prefer to sift one cup at a time. I use an 8” sifter, which can be found at Crate & Barrel. You could probably use a flour sifter with a hand crank or squeeze handle if that’s all you have available, though I’ve never tried. Add half of the powdered sugar to your KitchenAid, along with the egg white and extract. Mix well. Once combined, add in the rest of the powdered sugar, along with the molasses, half and half, and pumpkin pie spice. Molasses is not the easiest substance to work with. Do not worry about getting every last drop of the 1 ½ Tbsp into the mixture. When it stops dripping off the tablespoon, that’s enough. I use the same tablespoon to guestimate the ½ measurement. 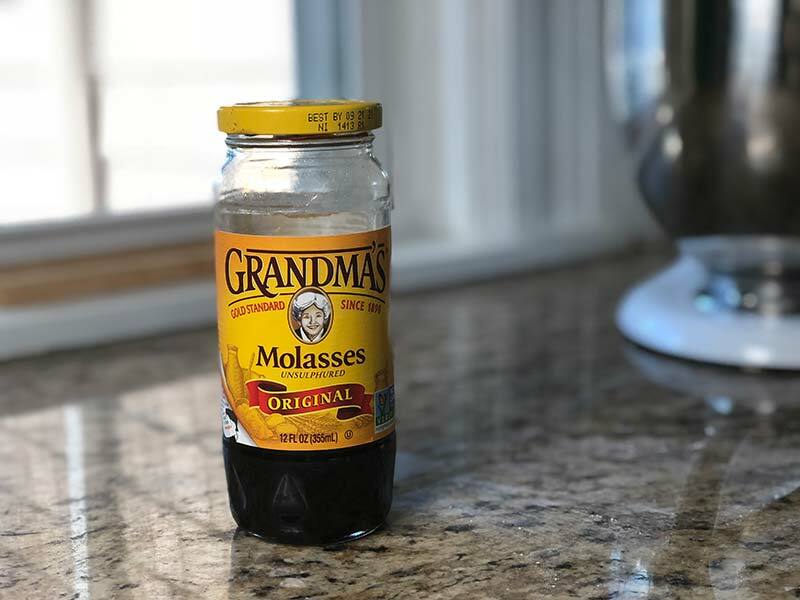 When it comes to the molasses, it doesn’t have to be precise. Beat all ingredients on high. You may need to stop and scrape the sides of the bowl to be sure everything gets incorporated. When you’re done, you’ll have a nice thick pumpkiny frosting. In a dutch oven, heat 3 inches of vegetable oil to 375 degrees. 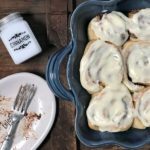 I use a Staub dutch oven, which can sometimes be found for a much cheaper price at HomeGoods. 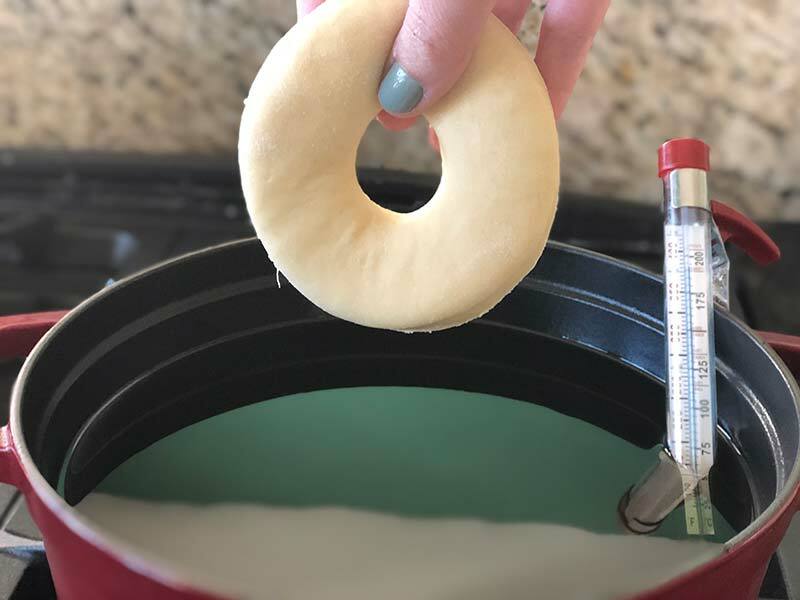 You will need to be sure that you are measuring the temperature of the oil precisely, which means you will need a candy/deep fry thermometer. I use one that’s made by Good Cook. It can be difficult to keep the temperature of the oil at 375 degrees. Once it hits that mark, turn down the heat to temper it from rising even more. Pay attention to the thermometer at all times and adjust the heat up or down as necessary. Place the donuts three at a time into the oil. Be very careful when you insert them into the dutch oven, as it’s easy for hot oil to splash up and burn you. If you slowly dip the donut into the oil until it is submerged to the hole and then let go, you should be safe. Fry the donuts for 1 ½ minutes on each side. 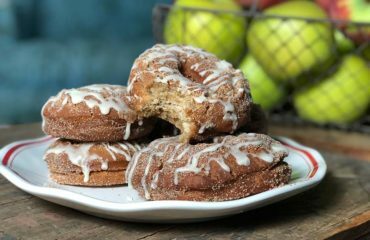 Use frying tongs to flip the donuts and to remove them from the oil when they are done frying—at which point you can place them on a paper towel lined plate and let them cool for at least five minutes. Frosting and Decorating the Donuts! Once all of the donuts have cooled for at least 5 minutes, it’s time for the fun part! 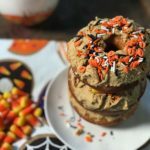 Scoop the pumpkin frosting into a small mixing bowl and pop it in the microwave for 20 seconds to get it soft. Then, using a small pastry spatula, spread the frosting over each donut in a circular motion. 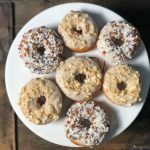 Next, garnish the donuts with sprinkles of your choice! 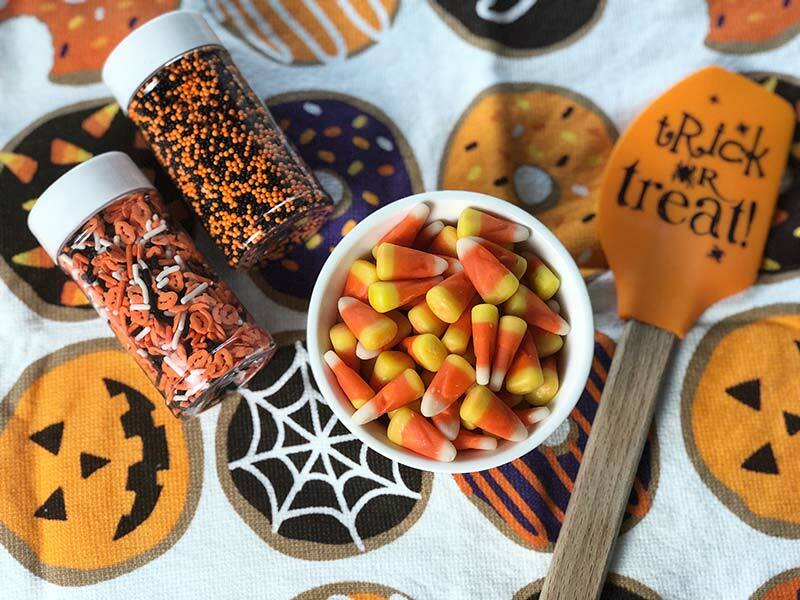 I went for a Halloween theme and used black and orange sprinkles. 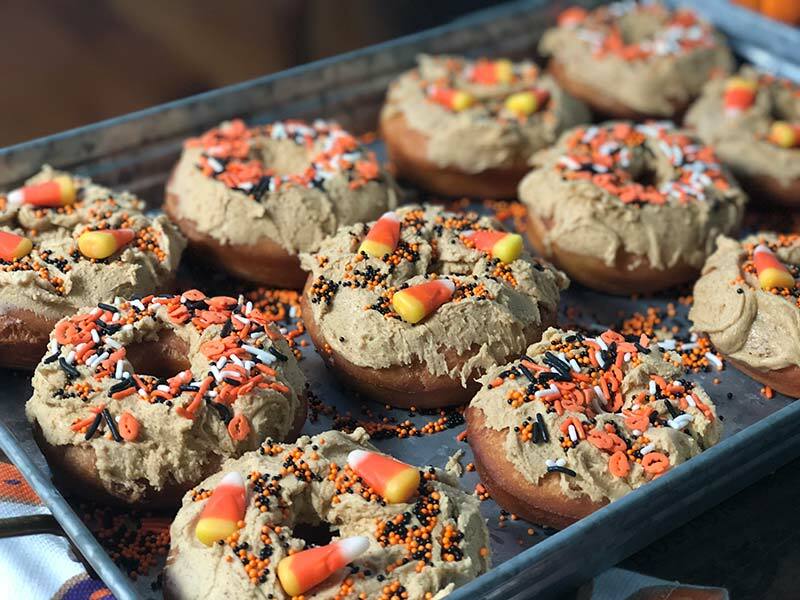 I even added candy corn to some of the donuts to make them look even more festive. 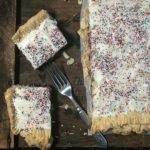 You will find that the frosting does start to dry pretty quickly, so you may need to push the sprinkles down gently with your fingers to keep them in place. Serve and enjoy the donuts right away! These donuts really are best when they are fresh. Hot from the frying oil, they have a nice crispness on the outside that they lose after they’ve been sitting for awhile. That being said, you can place the donuts in an airtight container (I prefer to use a cake carrier) for a couple of days. They won’t be as delicious the next day, but they’ll still be pretty damn good. 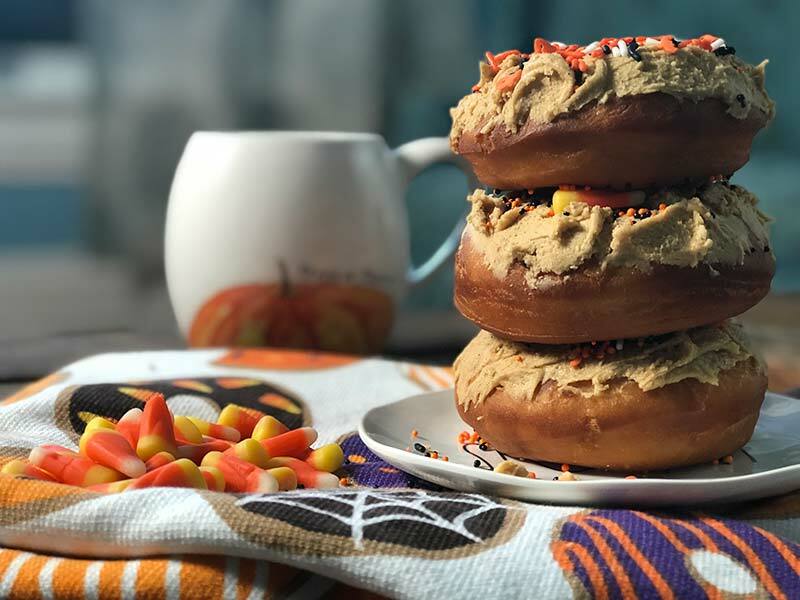 These pumpkin frosted donuts, topped with Halloween sprinkles (or jimmies, as we say here in New England), simply scream October! 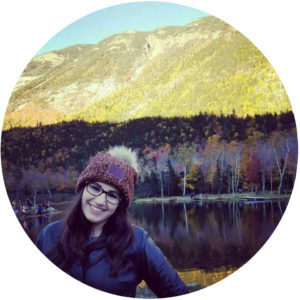 Dissolve yeast in warm water in KitchenAid mixer. Let sit for 5 minutes. Add buttermilk, butter, sugar, baking powder, salt and 1 ½ cups of flour to start. Mix well. Add in the remainder of the flour ½ cups at a time. Beat on high each time. Flour a clean countertop and place dough on it. Knead the dough with your hands, sprinkling it with more flour as needed. 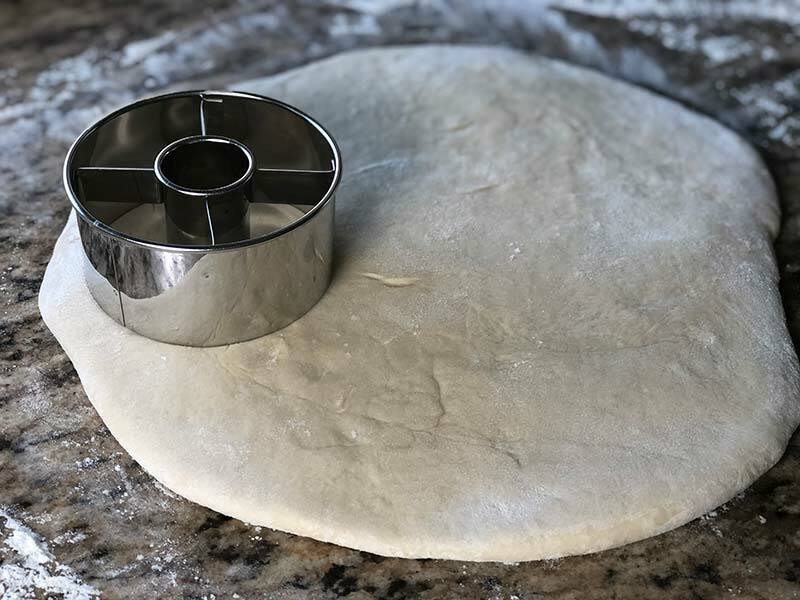 Roll out dough until ½ inch thick. Flour a donut cutter and cut donuts, putting the holes aside. When there is no more space to cut more, gather the dough scraps and holes, knead, and roll back out. You should be able to cut 12 total donuts. 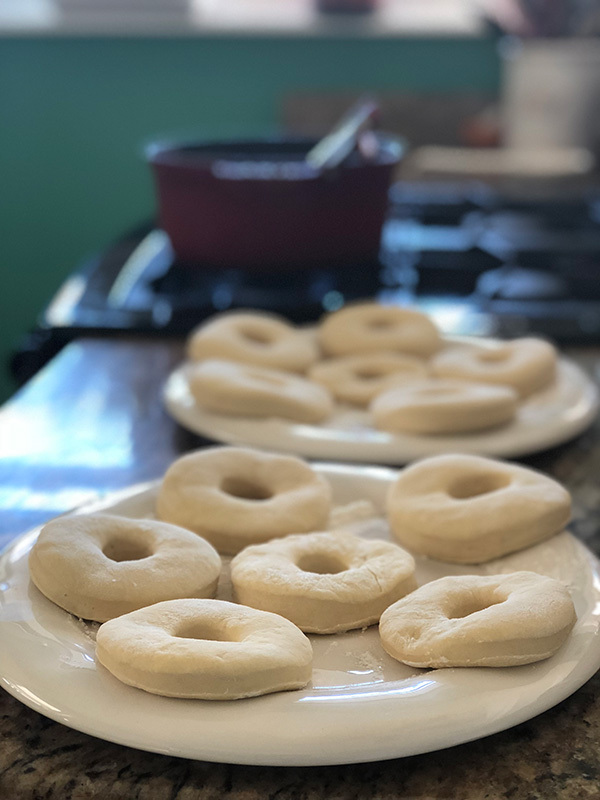 Set the cut donuts on a floured surface and cover with a cloth napkin. Let rise for one hour. 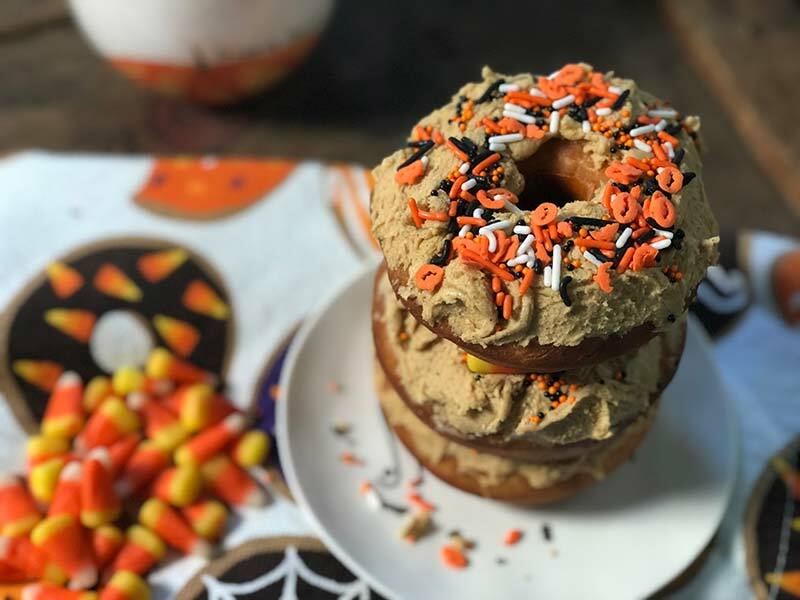 When you have about 20 minutes left until the donuts are done rising, you can start making the pumpkin spice frosting. In a dutch oven, heat 3 inches of vegetable oil to 375 degrees. Put donuts three at a time into the oil. Fry on each side for 1 ½ minutes. Use frying tongs to turn them over. When done frying, place them on a paper towel lined plate. 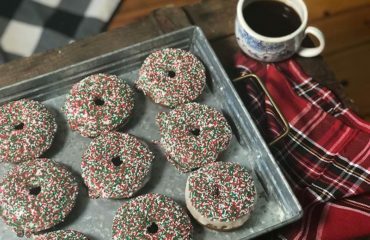 Let all the donuts cool for at least 5 minutes. Cream the butter in your KitchenAid mixer using the mixer paddle on high speed until fluffy. Add ½ of the powdered sugar, egg white, and pumpkin pie extract and mix well. Then, add the remaining powdered sugar, molasses, half and half, and pumpkin pie spice. Beat on high. 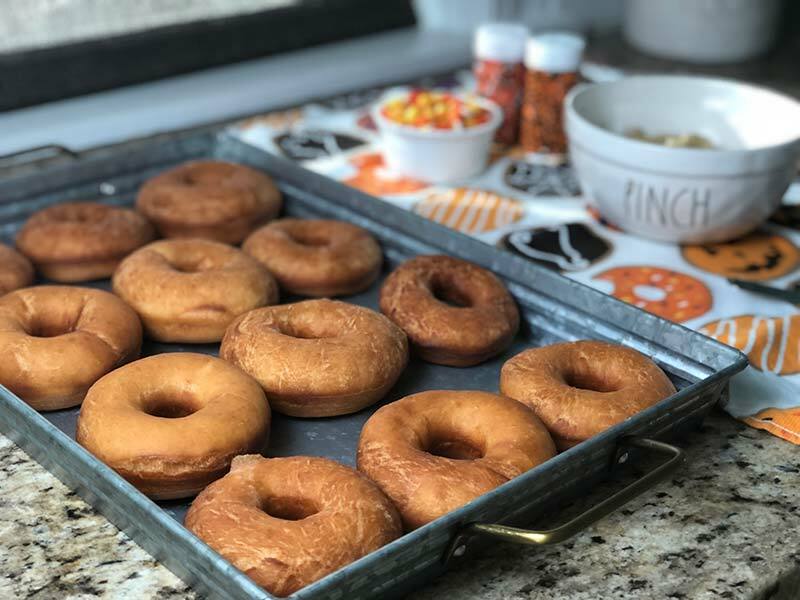 Frost the donuts and garnish them with Halloween sprinkles and candy corn!